Need a Fail-Safe Valve Operator? Use This One. If you want to operate a valve manually, but maintain the advantage of the fail-safe spring’s certainty of position when unattended, use this device. 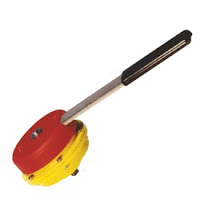 These spring return units are designed to be put on valves to prevent, or limit, the impact of potentially hazardous accidents resulting from uncontrolled flowing fluid and gasses or spillage. The Kinetrol manual fail-safe spring unit has a ISO/DIN female drive for direct mounting and ATEX category 2 options for use in hazardous areas. Kinetrol also offers a range of fire fail-safe spring assemblies that can be set to operate valves at pre-configured temperatures. Because they cannot be left in the wrong position, they are commonly referred to as "deadman handles". Theses devices provide reliable torque delivery for valve reseating and come with completely sealed spring housings that meet IP65 levels, totally protecting the internal spring from the environment, making them ideal for outdoor applications.